Hitotsubashi ICS provides an ideal environment for developing global leadership skills, with its diverse student body, and its curriculum that combines skills and knowledge offered by global standard MBA program with an emphasis on Japan and Asia. Hitotsubashi University was founded in 1875. It was the very first educational institute in Japan to teach business and commerce. Throughout its history, Hitotsubashi University has aspired to develop business leaders who possess an international perspective. Our forefathers used the phrase “Captains of Industry” to describe the role our alumni should play in society. It has been Hitotsubashi University's vision to be a leading academic institution specializing in the social sciences. Our faculty members are recognized internationally for their contributions to the fields of commerce and management, economics, law, and social sciences. The mission of Hitotsubashi ICS, known as “The Global knowledge Hub in Tokyo”, builds on Hitotsubashi University's tradition of excellence. Hitotsubashi ICS's mission goals are: (a) to continually develop new generations of global business leaders for Japan, Asia, and the world, and (b) to create knowledge and disseminate on a global scale research originating from Japan. Our aim is to develop leaders who are experts on Japan, immersed in Asia, and able to have an impact on the world. Hitotsubashi ICS offers a world-class curriculum that combines best practices in business education from all over the world, with a distinct focus on Japan and Japan's role in the global and Asian economies. It equips its students not only with fundamental business knowledge but also with the broad set of skills and management qualities required of global leaders. Characteristic of Hitotsubashi ICS graduates is possession of business-essential skills, including strategic thinking and problem solving and execution, a capacity to manage diversity with high cultural awareness, and an ability to foster innovation, and bridge differences in global cultures and business systems. Overview: Hitotsubashi ICS is offering participants the opportunity to earn an Executive MBA ("EMBA") qualification through a one-year program. Consistent with its long-standing MBA program, the EMBA will be taught entirely in English with the mission of integrating the "Best of Both Worlds". Uniquely, the ICS EMBA program will explore the strengths of both Japanese and Western management practices and seek to integrate those strengths in order to leverage them to meet the challenges of a changing business environment. The program focuses on the real world application of management theories, and as such will involve participants traveling to three locations outside of Japan to learn first hand about current issues such as doing business in emerging economies, technological disruption, and innovation. For more info please click here. The vision of Hitotsubashi ICS is “the Best of Two Worlds”. It aims to be the bridge between East and West, Large and Small, Global and Local, Old and New, Practice and Theory, Cooperation and Competition, and Business and Society. 1) East and West We realize that effective business practices vary by location and over time. We believe that global leaders do not need to have the “right” answer—rather they must be able to acknowledge diversity, work with ambiguity, and innovate by embracing paradox, combining opposites, and constantly challenging conventional wisdom. 2) Large and Small We choose to be a small school in one of the largest and most vibrant cities in the world. Every year we welcome about 60 new students to our MBA program and 4 new students to our DBA program. Our small size allows our faculty to get to know students personally and to mentor them on an individual basis. Our networks with leading corporations (both large and small) and universities around the world allow us to combine the advantages of scale with the speed and flexibility that comes from being small. 3) Global and Local We value our global student body and faculty, our global reach in thought leadership, and our global network of corporate and academic partners. At the same time, we are firmly positioned in Tokyo and Japan, and determined, through our research and teaching, to impart to the world a better understanding of business in the city and country in which we live and work. 4) Old and New We are a young graduate school in one of the oldest and most distinguished universities in Japan. We value our university's tradition, but also take seriously our role as an innovator. Our research and teaching combine lessons from the old and new—the companies and practices that drove Japan's economic development and the newest, most innovative companies and business areas that are our future. 5) Practice and Theory As a professional school, our focus is on practice, so essential in tackling the problems and challenges of today. This is why more than 60% of our full-time and visiting faculty members have full-time work experience in the private sector and 50% hold an MBA degree. However, the practice cannot be separated from theory, which helps us to define and resolve the problems and challenges of tomorrow. Our students learn the latest theories in management and apply them to real-life, evolving situations in today's business world. 6) Cooperation and Competition ICS students learn the importance of cooperation during Foundation Week (the last week in September), by engaging in various team-building exercises in an outdoor environment. Once classes start, students are encouraged to form study groups and asked to participate in a number of group projects. At the same time, competition is built into the curriculum in the form of a forced grading curve: 30% of the students in a given course are awarded an A, 60% a B, and 10% a C or below. Students also compete to join the seminar of their choice, to qualify for an internship or an overseas student exchange program, and to become recipients of student competition awards. 7) Business and Strategy We acknowledge that the interests of individual businesses and industries may conflict with the interest of society as a whole. We make every attempt in our curriculum and research to raise awareness of those conflicts and encourage resolution in a way that is both socially beneficial and creates long-term value. Our Global Citizenship course enables students to experience directly this conflict, through working with people and groups who experience particular challenges in daily life, including the physically and mentally disabled. Seven reasons to choose Hitotsubashi ICS for your MBA. 1) World-Class Curriculum The Eduniversal Best Masters Ranking for 2014-2015 ranked Hitotsubashi ICS number ten for full-time MBAs in the Far East Region, indicating the global excellence of Hitotsubashi ICS MBA program. ABEST21(The Alliance on Business Education and Scholarship for Tomorrow, a 21st-century organization)recognized Hitotsubashi ICS for a “World-class Curriculum” Excellence in Accreditation Award in 2009, and again in 2014, for its unique global curriculum based on the concept of “Best of Two Worlds”. Hitotsubashi ICS is the first full-time MBA program to be offered by a Japanese national university that is taught entirely in English. 2) Global Network Hitotsubashi ICS’s program is designed to expand the Hitotsubashi network of multiple generations of leaders in the global and Asian economies. Students can take international courses allied with Asian and global top business schools such as GNAM(Global Network for Advanced Management) - a 27 member-strong global consortium of the world’s leading business schools - and the BEST Alliance, a strategic alliance among Peking University’s Guanghua School of Management (in Beijing), Seoul National University Graduate School of Business (in Seoul),and Hitotsubashi ICS (in Tokyo). 3) Unparalleled Flexibility Hitotsubashi ICS applicants are able to choose whether to graduate in one year or in two years with an MBA Degree. For 2-year Program students, the second year’s curriculum can be “custom-built” by participating in activities such as the Double degree program, Exchange program, Internships, and/or Individual Research. Non-company sponsored students may work with the Career Services department in searching for post-MBA career opportunities. While 1-year Program students are not eligible for double-degree programs, exchange programs, or ICS internship programs, they may participate in the Global Network Week, a global exchange program offered by GNAM. 4) Strong Inter-Student Bonding Each year’s entering class is kept intentionally diverse and small with fewer than 60 students, creating an ideal environment for students to bond strongly with one another-one more unique feature of the Hitotsubashi ICS experience. This bonding among cohorts develops naturally through team-building exercises during Foundation Week, visits to the homes of faculty members, and various other team projects, activities, and exercises. 5) Strong Bonding Between Students and Experienced Faculty Hitotsubashi ICS has a world-class faculty with real-life work experience in business and/or teaching experience at other international business schools. The student/faculty (full-time and adjunct professors)ratio is close to 3:1, a ratio that no other leading business school in the world can match. The small student body enables intensive in-class interaction, as well as field research projects, company visits, and other out-of-class activities. The faculty also serves as “life mentors” for students. 6) A Campus in the Heart of Tokyo Hitotsubashi ICS is located in Hitotsubashi, Chiyoda Ward, within an easy walking distance of the Otemachi business district in central Tokyo, and just a few blocks from the Imperial Palace. Our location gives students and faculty quick, easy access to fieldwork study and company visits anywhere within the greater Tokyo metropolitan region, and enables companies’ top management to visit Hitotsubashi ICS classes as guest speakers. 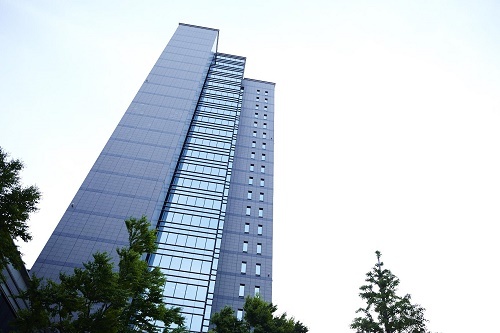 7) Competitive Cost of Tuition Hitotsubashi University is a national university corporation. Therefore, the cost of its tuition is very reasonable JPY 535,800 per year (plus a one-time matriculation fee of JPY282,000). Notwithstanding this cost of tuition, scholarships can be offered to students.